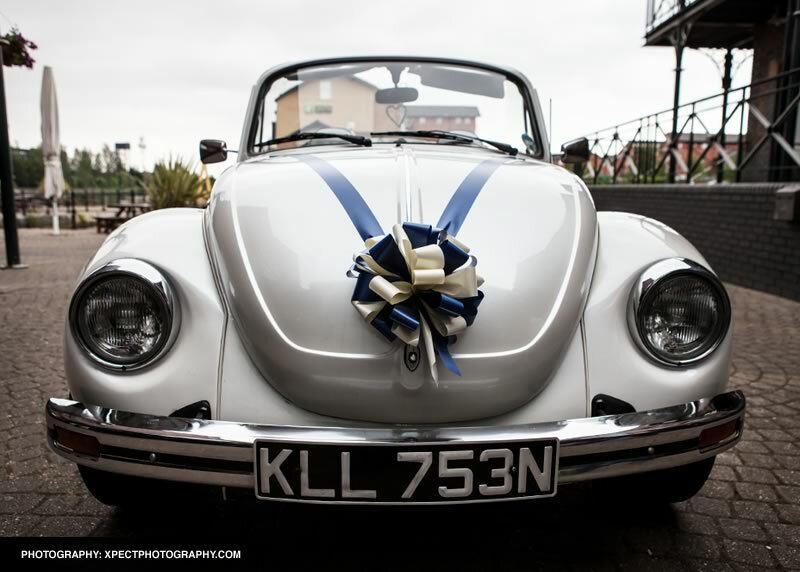 Balloons by Bev are proud to offer VW Weddings Wales. 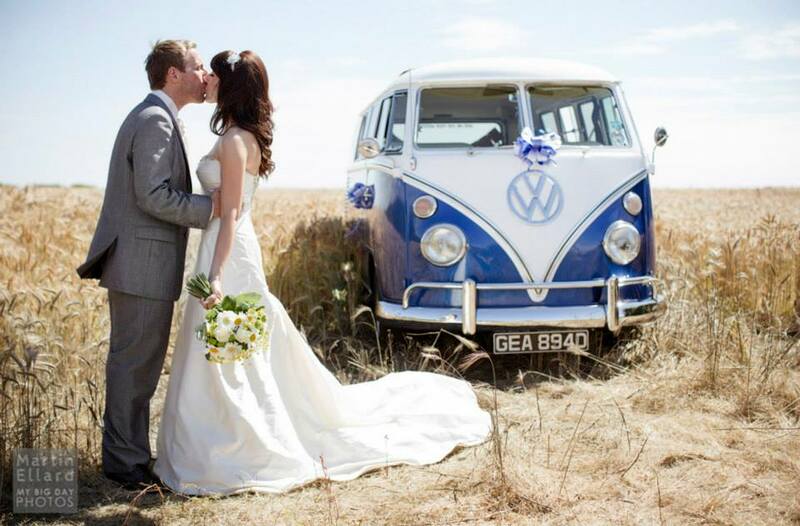 VW Weddings Wales is a unique Classic & Vintage VW Wedding Vehicle Hire service for the Wales & South West England. Other areas are available on request. All vehicles are chauffeur driven by friendly, courteous drivers who ensure you have a great time on your wedding day. All vehicles are decorated on the day with a choice of ribboning to match your colour scheme. We provide complimentary champagne or sparkling wine for every bridal couple, allowing you to travel in cool retro, glamorous style. We also offer a hamper of refreshements for your bridal party, for a small additional cost. As a special touch on the day, we like to produce a compilation mix of all of your favourite songs which you can listen and reminisce to during your journey with us. (This is only available with the Beetle hire). Our classic VW Karmann Beetle convertibles have spent most of their time in sunny California & Europe. Since their arrival to the UK they have both been lovingly restored to original standards. 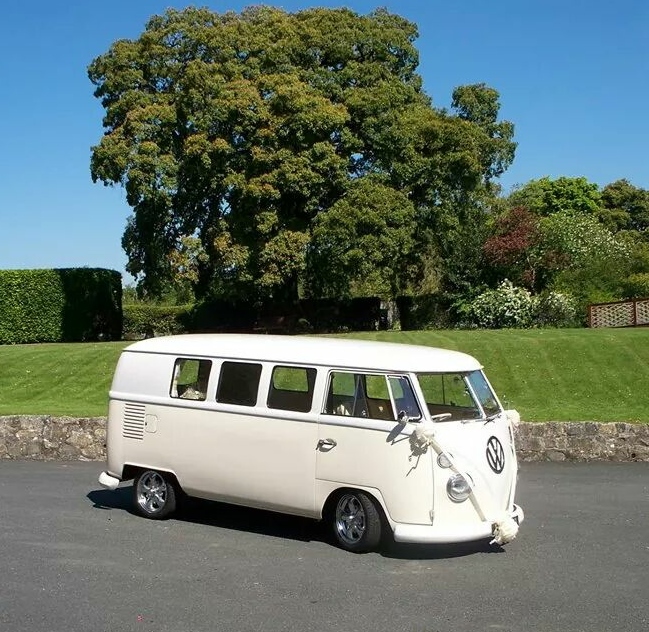 Daisy was our first addition to the VW Wedding Hire service. Since being imported from California in the early 90's she has undergone restoration to include gleaming Pearl White paintwork, brand new White leather and Tan suede interior, refitted tan carpeting and total restoration of her hood, headliner & chromewear to include running boards, bumpers and trims. Lily was also imported from Europe in the 90's. She came to us a bit battered and bruised and it took Marc over 10 hours to get her home from Leeds! The poor girl needed an engine rebuild and a lot of love and attention to become the stunner she now is. She had spent a few months during 2009/10 with our bodywork restorer, where she has been fully prepared and resprayed in a gorgeous Pearl White colour. Her damaged parts replaced and as a result has returned to us looking like a completely different car. Her interior has been reupholstered in White & Navy Blue leatherette with a brand new fully restored hood & headliner in Navy Blue. We also replaced her chromewear , running boards & bumpers. Her original GT wheels have been painted in Pearl White to match her gleaming white bodywork. She too has received very positive comments from customers and admirers and Daisy now has a bit of competition as Lily is equally as gorgeous as her now. Oscar joined our fleet in 2009 and loves to transport bridal parties, bridesmaids or even groom and ushers to and from the ceremony & reception locations. Fully restored to excellent standards with full U.S. spec chrome pack and gleaming Blue & White paintwork. He is capable of transporting up to 6 adult passengers within his cream leather interior. 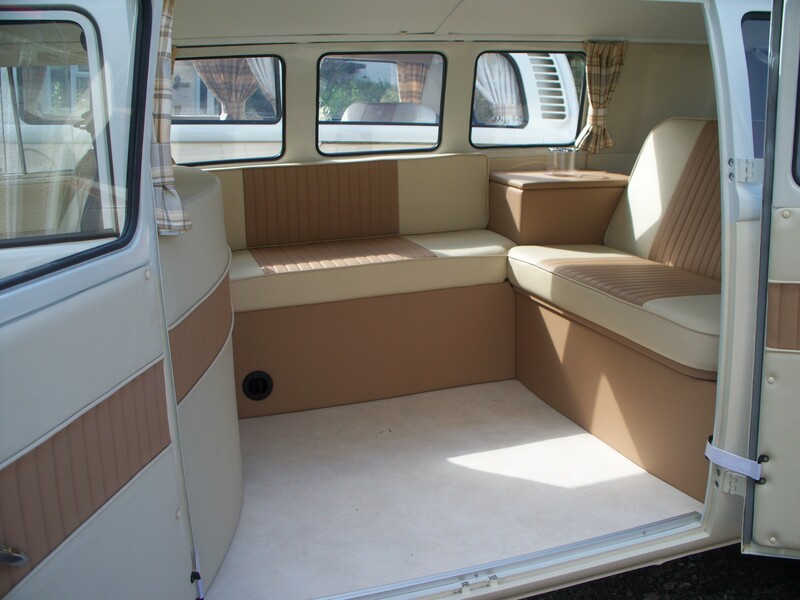 A perfect complimentary vehicle for Daisy & Lily..
Wally is a gorgeous cream and white Splitscreen camper van that sits up to 5 adult passengers within its stunning interior. Email your enquiry to vwweddingswales@hotmail.com or please visit our website to complete an enquiry form. Take a look at our facebook gallery and testimonials and become a fan!